With a title like that you can guess this isn't going to be a grim and serious drama series. Yes, it's time for laughs as Comedy Central and the BBC team up to rip into epic fantasy. The Makonian Empire dominates three continents and its Emperor is the most powerful man in the world. Chancellor Dongalor, ruler of the province of Hessemeel, is his servant but his star has fallen as the province has suffered from an economic downturn (brought about by the 'whore-caravans' now preferring to steer clear of the province). Dongalor now plots to supplant the Emperor using a mystical weapon known the Eye of Gulga Grymna (which appears to be a magical medieval version of the Death Star's superlaser, able to destroy entire villages in an instant), assisted by his loyal minion Barnabas. Meanwhile, an Empire-wide resistance movement has been brutally crushed and its leader, General Arcadius, is imprisoned in Hessemeel Castle. The rebels have scattered into small bands which carry on a guerrilla war. One such band is led by the handsome and somewhat egotistical Krod Mandoon and also consists of his pagan girlfriend Aneka, failed wizard Zezelryck and the pig-man Loquasto (who is technically Krod's slave, but Krod refuses to let Loquasto call him "Master," fearing it impacts negatively on his PR image). Mandoon mounts a sneak attack on the castle to free Arcadius, but Arcadius is killed in the process. He tells Krod that he is the 'Golden One' prophesied to lead the resistance to victory. Arcadius' boyfriend, Bruce, joins Krod's band as it sets out to stop Dongalor's plan whilst also dealing with internal divisions. Krod Mandoon is a curious beast. It can have you laughing one minute and then cringing with embarrassment for the next five. Refreshingly, rather than just relying on the daftness of the fantasy genre for laughs, Mandoon plays the setting and backdrop reasonably straight and attempts to mine the humour from the characters and situations rather than the world itself. This is a good move as shows built on taking the mickey out of a silly premise tend not to work in the first place. Also, the cast in Mandoon is pretty good, with the actors all generally putting in a lot of effort and enthusiasm. In comedic terms the highlight of the show is the relationship between Dongalor (played by Little Britain's Matt Lucas) and Barnabas (Alex MacQueen), which comes off as a demented take on Jeeves and Wooster where Jeeves is somewhat bumbling and incompetent but also a psychopath who tends to kill anyone who brings him bad news. Almost every scene with these two is great and it's a disappointment that their screentime is dramatically cut to just one or two scenes per episode in the latter half of the season. The Hungarian scenery, the impressive sets and the decent special effects are also all worthy of praise. Unfortunately, massive problems lie elsewhere. Whilst the actors are all at least okay, Bruce (Marques Ray) is a gay caricature who would have been cliched twenty years ago, let alone today. There are a few signs of a more interesting character lurking in there (particularly in the final episode, when we find out how good a fighter he is), but the predictable lines and campy characterisation are painful to sit through. Loquasto also doesn't have very much to do either apart from the odd fart joke. Sean Maguire is reasonably effective as Krod with some decent comic timing, and India de Beaufort is memorable as Aneka. Her character is a pagan with 'relaxed' views on sexuality and monogamy (to Krod's disquiet) and I was surprised to see this was treated with some (emphasis on the some) respect: the results of the situation are played for laughs but at no time is her character forced to betray her beliefs. Elsewhere, John Rhys-Davies crops up in a series of extended cameos as a powerful sorcerer on the side of good, and James Murray as Ralph (pronounced 'Raif') Longshaft is excellent as the "Hail fellow, well-met," new leader of the resistance. So, a solid cast, some good performances and some decent characterisation are all there, but where the production starts to fall apart is the script. It's interesting and possibly telling to note that some of the Dongalor-Barnabas exchanges were ad-libbed or altered on set by the actors, because elsewhere the quality is completely all over the place. The idea of a 'too friendly' cyclops is funny but is then excessively overused (a great throwaway gag turned into a tedious ten-minute scene based just on sexual innuendo). Some interesting script exchanges on paganism are then followed by a lame succubi sequence that goes exactly how you imagine it would. Worst of all is the dog scene in the finale, which seems to have been ripped from a brief dialogue exchange in a Red Dwarf episode from twenty years ago. There's some things you don't want to see on screen, you know? After assessing the pros and cons, I have to judge Krod Mandoon's first season (**) a not-disastrous but still disappointing failure. There's some excellent potential in there and it's better and funnier than a lot of mainstream sitcoms, but at the same time it misses the mark more often than it hits it, and it wastes its greatest comedic asset - Lucas and MacQueen - in the latter three episodes (otherwise it would have gotten an extra half-star). It is possible that the series will improve in a second season if it can move beyond the obvious gags and start doing something more interesting. 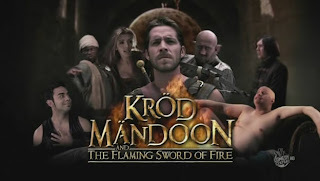 Krod Mandoon's first season is now complete in the USA and will air in the UK in June. I'm interested in if the series will ever be aired in Germany. Great review. You captured my thoughts exactly. I loved the first episode; the way they played off the fantasy setting, instead of only making fun of it. But it really did get weaker as the series progressed. Still would love to see it picked up for another season. It's so different than other stuff out there. Ysabel by Guy Gavriel Kay optioned as a movie.